The displays consists of two main elements. 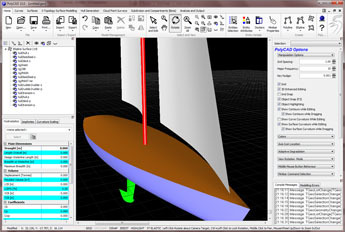 The model view and the editor tool windows. The model view is when the entities are created and edited etc. Most interative entities are created from the relevant section on the Main Tab Bar. The view is manipulated using View Functions. Entities are directly interacted with using the Entity Menu which will pop-up when the mouse is Right-Clicked in the model view. There are ten Docking Tool Windows which provide mode specific functionality for various operations. All editor tool windows can be docked around the edge of the main window.